Next week I will be publishing my first novel. It’s called White Witch : Black Witch / Initiate. It’s the first of a planned series, and whilst I’ll be self publishing initially, I hope to pick up a publisher. Or a literary agent. Preferably both. It’s been eight years in the making – and goodness knows how many rewrites and drafts. I’ve had to learn a completely new set of skills. Writing a novel is totally different to any other kind of writing – particularly screenplay writing. During all the years I worked on the manuscript I told no-one, other than my family, and a few close and trusted friends. No-one else has known that I’ve been tooling away on this story, and developing my craft, for so long. Finally though I decided to tidy it up and get it out while I’ve got a bit of breathing space with my intuition film. I think I’m going to be very busy next year with the film. 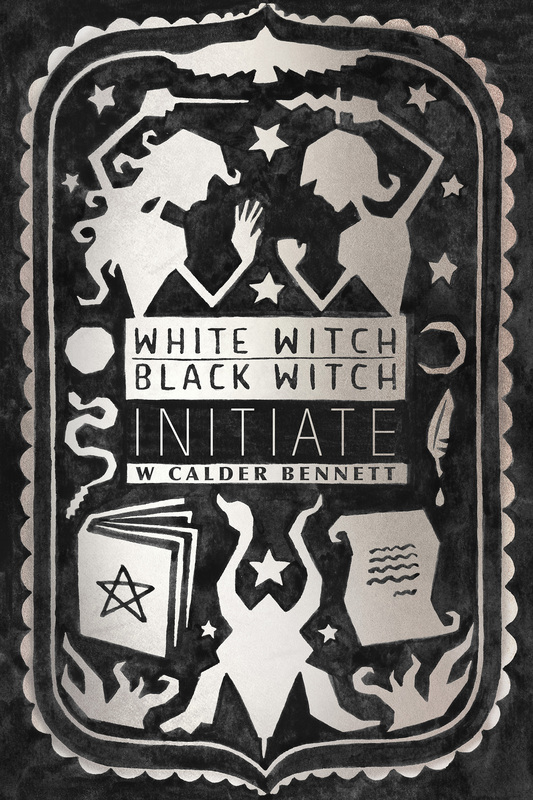 I’m writing it under the name: W Calder Bennett. My full name is William Arthur Calder Bennett. I’m doing this so that there’s a clear distinction between my work as a novelist and my work as a film writer and director, for which I’m known as Bill Bennett, of course. Here below is the cover of the book. The design was done by a very talented young lass named Cass Gaunson at Carnival Studios, under the supervision of Demi Hopkins. Demi and his team designed the covers of my two other books – The Way, My Way, and Photo Camino. For those on this blog, if you’re interested, I’ll send you a Kindle copy gratis once it’s published – probably next weekend. All I ask is that you write a review on Amazon and Goodreads when you finish. You never cease to truly amaze. Wow, what else don’t we know! Are you a closet fashion designer, professional singer/songwriter? Oui oui oui please send me a copy, and congratulations and bonne chance mon ami. You are incredible.How do you manage do do every thing? Haha – Marie, very sweet of you. You are a gorgeous lady! I’ll send you a copy when it’s all ready. Hope you are well and happy!! Looking forward to the read….finally! Now you might think why l said that…as much as you kept this close to your chest… you mentioned this once before, early on during your time on your Camino Frances…in a blog response to one of my postings. You sure do pack a lot into your days. Congratulations, and count me in among the readers. No worries Clare – will do. And welcome back! You are kind of super human Bill—do you know how to stop time so you can do things while the rest of us are in a suspended state??! I have trouble sometimes just getting my list of errands done in a day. It’s quite remarkable what you have the interest and energy for. Hurray! Totally agree. Hadn’t thought of it before but maybe rather than super human powers, maybe he is an alien as it is not humanly possible to accomplish all that he does in a day. Hi Kathryn – it helps that I live in a small country town, with few distractions, and now Jennifer and I don’t have children to worry about any more. Plus I love what I do… Will send you a book when it’s up on Kindle..
Ah, success. Have a new hard drive and have to reset all my settings. I think we had a glimpse of the other side of Bill’s brain on the Portuguese Camino Steve – thanks to those bottles of white port!!! And it wasn’t always a pretty sight!!! Congratulations on another major accomplishment! I’d definitely like a copy, thanks. I would be honored to read and review a copy of the book. Thanks. haha – ok George – a book coming your way when it’s ready… thanks! George – can you please send me an email at billpgsblog@gmail.com so that I can send you a copy of the book? Very exciting for you and for us readers. Book cover is awesome. Have you started the second in the trilogy? Don’t what you slacking off……..